As well as the Spring Equinox happening this weekend, on Saturday, 19 March it is also Earth Hour. This is an annual event when people are encouraged to turn off all non-essential electric lights for an hour as a symbol for their commitment to the planet. Earth Hour takes place from 8.30pm to 9.30pm on Saturday at local timezones all over the world and is a grassroots event, organised by the World Wildlife Fund. The idea is that instead of using electricity, you do things by candlelight. Normal Earth Hour activities include dining by candlelight, playing games or having a candlelit procession. However, you could try out some candle magic while the electric lights are off - and if you are planning a ritual to celebrate the Spring Equinox, Earth Hour would be a good time to do it. If you want to measure the hour by candlight too, here's how - and it is really easy. All you need to do is get a household candle or dinner candle that burns for a stated length of time. The candle in the picture is a Price's household candle with a 5-hour burn time. 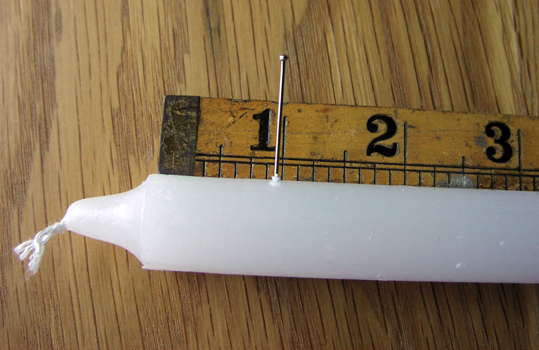 Just put a ruler along the edge of the candle, measure the length that will burn in an hour and stick a pin in - simple! If you prefer, you could carve a groove in the candle at that point or you could use a candle marking pen to draw a line. If you fancy the idea of doing some candle magic for Earth Hour too, my book Pagan Portals - Candle Magic: A witch's guide to spells and rituals has lots of ideas, from simple spells to make a wish up to candle rituals to honour the Earth and help protect the planet.